President John Dramani Mahama has offered to pay all expenses to transport the remains of former Ghana Actors’ Guild President the late Nii Odoi Mensah to Ghana. This was revealed on Monday afternoon April 25, when a government delegation visited the late actor’s residence at Teshie Nuagua in Accra to sympathize with his family. “When I heard that Odoi Mensah had passed away in China and bringing his remains to Ghana has become a problem, we decided to come to the family and discuss how we can be able to bring his body back home. I also informed the President about the situation and the President said he can’t allow the remains of a proud son of Ghana to be stuck in China. The President said I should inform the family to wipe away their tears because he would do whatever it takes and pay any amount of money needed to bring Odoi Mensah’s remains to Ghana for a befitting burial”. Hon. Ofosu Agyare also added that the Chief of Staff has already started arrangements for the body to be transported to Ghana, so she would return to the Flagstaff House with some of the family members to meet the Chief of Staff to facilitate the process as soon as possible. Head of the late Odoi Mensah’s family, Nii Kwa on behalf of the family, gladly accepted the President’s offer and thanked him for his kind gesture. Other members of the delegation included actors Van Vicker, Ziggy Netteyson, aspiring President of Ghana Actors’ Guild Mr. Abeiku Seigo among others. 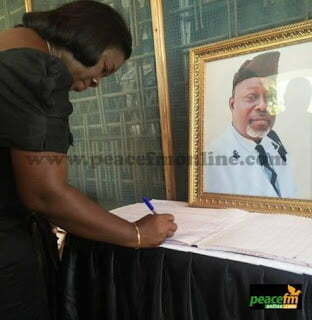 Nii Odoi Mensah, who once served as President of the Ghana Actors Guild, died on Tuesday April, 12, 2016 while he was undergoing kidney treatment in China, after battling with the disease for some years. Before his death, Nii Odoi Mensah needed $26,000 for treatment but was unable to raise the said amount and after his demise, it was revealed that the remains of the late veteran actor cannot be flown to Ghana for burial if his family is not able to raise a total of $68,000. His family later came out to deny that the among needed to transport his remains to Ghana is far lesser that the reported amount of $68,000 but regardless of the amount, the President has offered to pay for everything.